Each scoop of VegeGreens vegan Protein contains a full serving of two of our most popular products. It features over 70 botanical ingredients including the complete array of land, sea and cruciferous vegetables, super green foods, EFAs, probiotics and herbal co-factors found in VegeGreens, along with the blend of 5 vegetarian proteins and entire family support nutrients found in Harmonized Vegan Protein. This 100% vegan, whole food supplement is alkaline forming and is loaded with amino acids, phytochemicals, natural antioxidants and trace minerals. The support nutrients enhance digestion, absorption and utilization of the entire formula and help to balance liver and kidney function to ensure optimum compatibility. VegeGreens Vegan Protein is an excellent source of dietary protein and provides all the goodness of fresh vegetables in a highly concentrated form. It is easy to digest and offers the full spectrum of both essential and non essential amino acids. Each serving contains 26 grams of complete protein and is ideal for anyone wishing to increase their protein intake while avoiding dairy or animal source proteins. 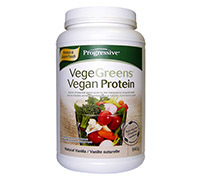 VegeGreens Vegan Protein has been professionally formulated and energetically tested. It is naturally flavoured and sweetened and contains no artificial ingredients of any kind. It is also routinely screened for pesticides, herbicides and heavy metals to help ensure optimum purity. VegeGreens Vegan Protein blends into a nutrient packed shake that makes a perfect breakfast smoothie. It can also be enjoyed anytime of the day as a high protein snack including before or after exercising. Spirulina: is an edible water-grown algae. Some consider it a complete food. It contains 60-70% protein plus a variety of other nutrients including the essential fatty acids, GLA and linoleic acid, vitamin B12, iron, RNA, DNA and trace minerals. It is such a good source of protein and vitamin B12 that it is recommended for vegetarians or those who cannot tolerate meat. Its high protein levels also helps to stabilize blood sugar if spirulina is taken between meals. The essential fatty acids in spirulina help to regulate high cholesterol. Spirulina also contains a significant amount of chlorophyll, which speeds the release of toxins from the bloodstream. Chlorophyll is useful for increasing the oxygenation of tissues because a molecule of chlorophyll resembles the human hemoglobin (oxygen-carrying) molecule. Finally spirulina contains phycocyanin, a blue-green pigment that has been shown in animal models to increase the survival rate in liver cancer. Natural health practitioners, for a variety of conditions including convalescence, hypoglycemia, high cholesterol, chemical or metal toxicity, cancer, malnutrition and malabsorption recommend spirulina. As a supplement spirulina is found in tablets and powder. Some commercial “green food” smoothies and “energy” drinks may contain spirulina. Green food supplements are combinations of medicinal foods and herbs, and may contain spirulina. Lecithin: is an emulsifying agent that contains mostly choline, the B vitamin, and smaller amounts of the essential fatty acid linoleic acid and inositol. Emulsifying means that it makes fat soluble in water. Its emulsifying properties allow it to prevent fatty build-ups in the body, for example in the blood vessels and liver. Lecithin helps maintain cholesterol levels because it’s healthy fats build HDL cholesterol. HDL cholesterol is responsible for moving fat, from storage or plaques, into the liver where processing and excretion of fat occurs. By decreasing fatty build-up on arteries it helps to regulate blood pressure. Lecithin is a large component of all cell membranes because it regulates the passage of substances into and out of the cell. The choline it contains can cross the blood-brain barrier to produce brain chemicals (neurotransmitters) that aid in memory - in particular acetylcholine. The protective coating of the brain and nerve cells are also composed of choline. In this respect lecithin helps to make the sheath (myelin) that surrounds the nerves that conduct messages from the brain to the muscles and organs of your body, performing a similar function to the insulation sheathing of electrical wires. If this protective sheath degenerates (as in MS), a "shorting out" of the message that the nerve is carrying occurs. Lecithin has been used for cardiovascular disease, improving memory, repairing the liver, AIDS, chronic fatigue syndrome, herpes and other immune system disorders. Most lecithin is derived from soybeans. New research is finding greater value from supplements made from fresh egg yolk. Lecithin can be purchased in capsules or as granules. The granules should be refrigerated for freshness because the essential fatty acid component can go rancid. Directions: Mix 1 scoop (43.5g) of VegeGreens Vegan Protein into 350-400 ml of the beverage of your choice. Consume 1 or 2 servings daily.